Texas Fiberglass Pools Inc. offers Fort Worth fiberglass pool repair, fiberglass pool resurfacing, pool maintenance, and a host of other services that ensure your swimming pool looks as beautiful as the rest of your home. We can revitalize your pool, hot tub, or fountain and save you a bundle in pool repairs and replacements. 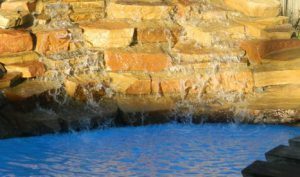 Providing both commercial and residential services throughout the Fort Worth community, the professionals at Texas Fiberglass Pools Inc. are experts at pool, spa, water feature, and baptistery resurfacing. Our team of Fort Worth pool repair contractors are also able to handle deck resurfacing, leak detection, and pool plumbing repairs and installations as well. Our pool maintenance services take the responsibility of keeping your pool fresh and clean off of your shoulders, so that you can focus on enjoying your outdoor space. Our Fort Worth fiberglass pool repair and fiberglass pool resurfacing services are recommended for units constructed of ground gunite, concrete, or block and fiberglass walled with concrete bottoms. People commonly use a vinyl, concrete and paint, or concrete and plaster renovation; but these materials are cheap, require more maintenance, and wear out faster than fiberglass. Fiberglass coated pools are able to handle all the angles; steps, curves, and other features within a pool or hot tub are easily coated by fiberglass. Compared to other resurfacing materials, the fiberglass pool resurfacing that we offer through Texas Fiberglass Pools Inc. will hold up for more years of use and require less maintenance. Plumbing repairs are an unavoidable necessity in any commercial or residential property. We are the go-to experts for all of your plumbing needs. If you are in need of Fort Worth fiberglass pool repair, plumbing maintenance, or a new installation, then we can help. Our pool contractors handle the most complex Fort Worth plumbing repair jobs with industry expertise, timeliness, precision, and – most importantly – success. We use only the most trusted and durable parts available on the market for all pool and plumbing repairs to ensure our repairs are guaranteed to extend the life of your property and prevent problems caused by unreliable materials. Whether repairing a crack in a hot tub or installing new coping around the edge of your swimming pool to elevate its style, we’ve yet to encounter a job that our experts can’t handle. From Sundance Square to Rivercrest, Texas Fiberglass Pools Inc. is the go-to source for home and business owners in the Fort Worth area for fast and affordable solutions. Contact us today for more information!